This recipe is exactly as it sounds: Extremely tasty, elegant and green…all you need to enjoy it is fine ingredients and great company across the table, on a warm veranda tête-à-tête! 1. For the pea stock: Remove the peas from their pods and separate the larger peas from the smaller. Place in two separate bowls. Put the smaller peas in a pot along with the mint stalks. Cover with 1 litre of water, bring to a boil, and simmer for 10 to 15 minutes, until the stock is flavourful. Strain. 2. 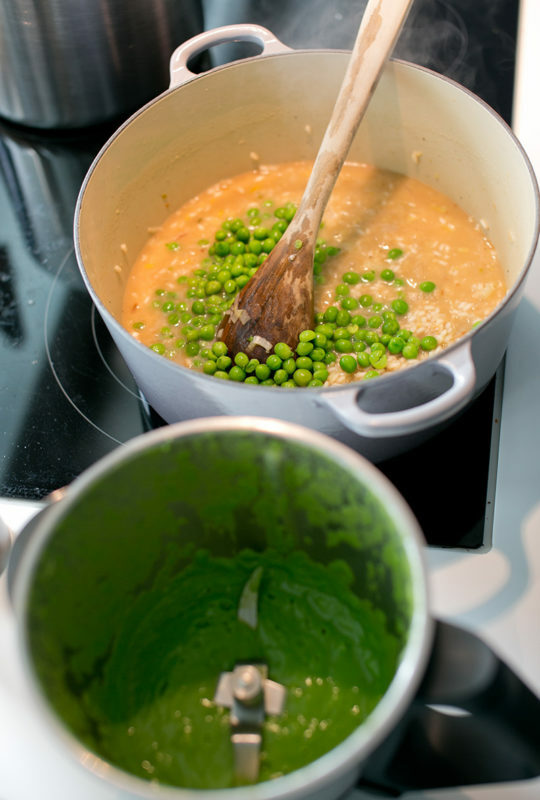 For the pea puree: Place the larger peas in a small pan with a small amount of water and salt. Cook until very soft. Puree in a liquidiser or a blender. Cool over a bowl of iced water (this will ensure the peas retain their bright colour). Set aside. 3. For the risotto: In a heavy-based casserole heat half the butter and all of the olive oil until warm, add the onion and celery. Cook slowly over a medium heat until soft. Add the rice and stir continuously over the heat until the oils have been absorbed, approximately 4 to 5 minutes. Pour the Prosecco into the pan and continue to stir until the liquid is absorbed. Season with salt and pepper. 4. 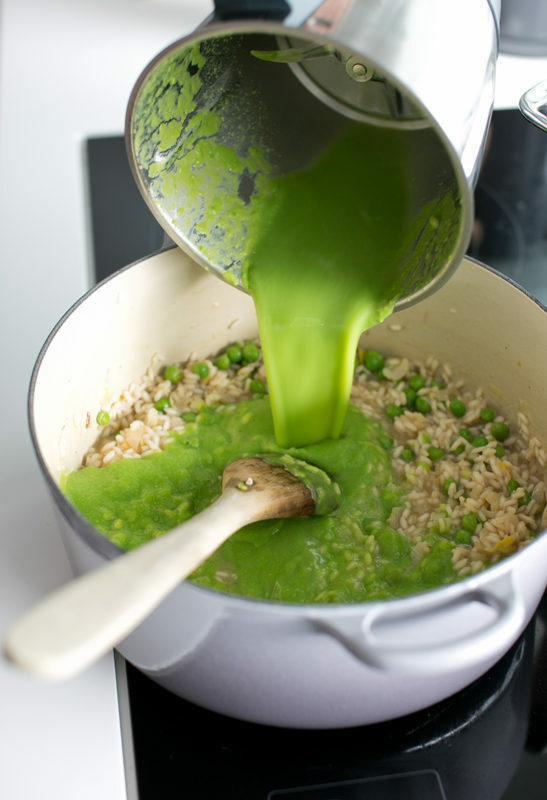 Strain the still warm pea stock and add it to the rice, little by little, using a ladle (the rice will, upon completion, use approximately 500 ml of pea stock). 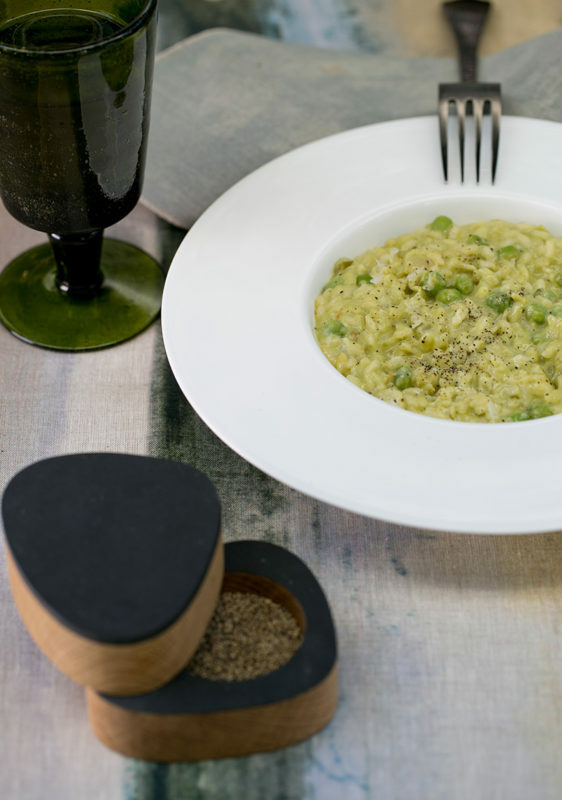 Stir the risotto each time a ladleful is added. (Note: Before adding subsequent ladles of stock ensure that the previous liquid has been fully absorbed. Also, keep checking the texture of the rice. It should retain a little firmness to the bite.) The risotto will cook within 15 to 20 minutes. 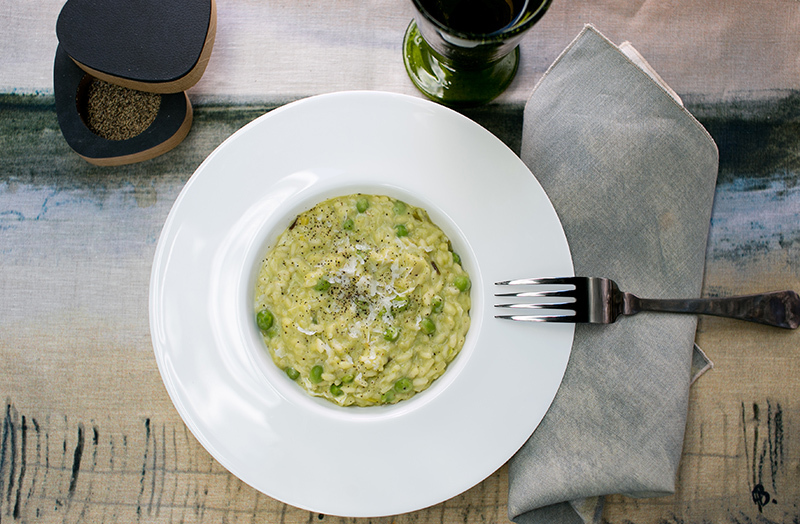 However, 5 minutes before the risotto is completely cooked add the pea puree. This will turn the risotto to a brilliant (and lovely) green. 5. Gently stir in the goat cheese and the remaining butter into the risotto. 6. Serve on warmed plates with some freshly grated Parmesan and freshly ground black pepper sprinkled over the top.